1955 Franklin half dollar value is $5.63 for a coin with moderate to heavy wear. 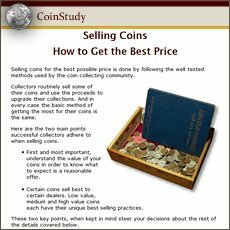 True potential of your coin's worth is found by judging its condition accurately. Coin collectors spend a great deal of time judging condition; it is directly tied to value. A 1955 Franklin half dollar is also a rather scarce date, your coin is a promising find. It is the lowest mintage - struck for circulation - of any date; just under 2.5 million business strikes produced. This fact alone gives your coin a certain appeal as a collectible. Additionally, mintmarks used to identify the different mints, are not the usual factor in value, all 1955 Franklin halves were coined at the main mint in Philadelphia. Collectors have only this one low mintage coin to represent as their 1955 half dollar. Up to this point, we have focused on 1955 halves intended for circulation. There is also the possibility your coin is the "proof" issue of this year. These were minted especially for sale to collectors. Old time collections often contain an example of a proof half. Further down the page proof a 1955 Franklin half dollar value is illustrated. 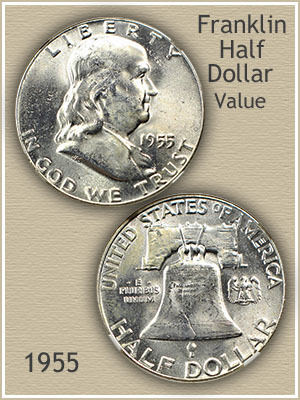 Circulated 1955 halves are studied closely by collectors. The effort is made to determine if the coin is valued higher than its underlining bullion price. Subtle details are judged to determine a grade. Your coin may be worn, however if enough detail remains it becomes desirable to collectors and worth a small premium. A special series of Franklin half dollars were struck by the mint, using polished dies and polished coin blanks. The results are stunning, as displayed by this 1955 example. Known as "proofs" these are a very popular sub-series with collectors. Proof Franklin's are distinctly different in appearance, the fields of the coin have a mirror like quality and details are very bold. Notably, fine details are easily seen, improving the eye appeal. One word of caution, the surface of the coin is delicate, susceptible to marks. Handle gently and only by the edges, even minor disruptions to their appearance down grade value. Since most of these coins were placed into collections, and well cared for, you would recognize these proof coins as very different to regular business strikes. Coins minted for circulation just don't have the qualities of poofs. It is unlikely you would find one mixed loosely with other coins. Values of 1955 Franklin half dollar proofs are in the $100 range. Pictured is an example that sold at a David Lawrence rare coin auction for $115. 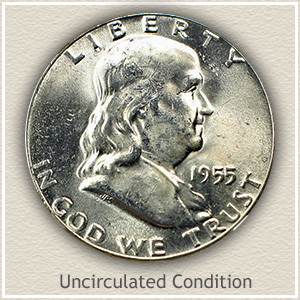 Uncirculated: Representing the highest 1955 Franklin half dollar value, "uncirculated" condition describes a coin with no wear to the surface. This is one of the hardest of all grades to detect since only the slightest traces of wear exclude a coin. If you have a magnifying glass handy inspect Franklin's cheek and chin. What needs to remain is a matching texture to these high point of the design compared to the surrounding areas. Wear renders these high point smooth and with a slight color difference. 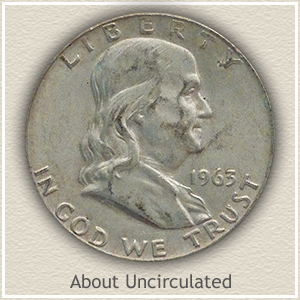 About Uncirculated: When a slight amount of wear is present on the surface, a coin is graded "about uncirculated." To qualify for this grade your coin must exhibit mint luster as a starting point. This luster is the original surface of the coin when first minted, and is the first to wear as the coin is used and handled. With luster largely intact, only trace amounts of wear confined to the very tops of the high parts of the design are acceptable. Tilt your coin under a light, if wear is present a slight dulling of the shine is found on small areas of Franklin's cheek and chin. 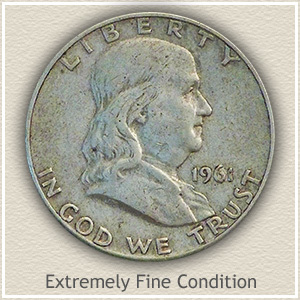 Extremely Fine: In the "extremely fine" grade wear has removed all mint luster, your coin is a nice light silver grey. The important aspect of this grade; wear is obvious; however the fine details are still present. The reverse is the easiest to judge, focusing your attention on the center of the Liberty bell the lettering needs to show, although now because of wear, very weak. Overall this is still a nice sharply detailed coin. 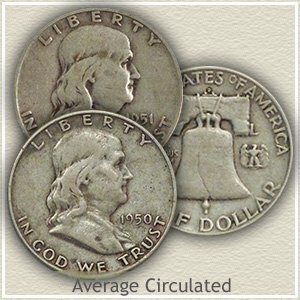 Average Circulated: Once wear has removed the fine details, 1955 Franklin half dollar value is now at the bullion price level, currently $5.63 each. No collector value is awarded at this level of preservation. Compared to the higher grade this coin lacks any visual excitement. The Liberty bell is missing all lettering leaving just an outline. Franklin is also noticeable worn with distinctly flat areas across his face and hair. Both of these combined places a coin solidly in the average circulated condition. 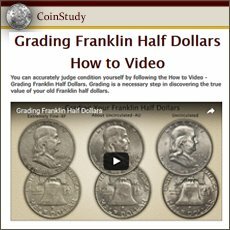 Return to Coin Values Discovery... find 1955 Franklin half dollar value and... a complete index of image and text links to all US Coin series, from Cents to Gold. Old coins retain a strong collector following. Walking Liberty halves are an example highlighing the value of silver in old coins. Additiionally, within each series are rare date and mintmark combinations with even greater demand. Revisit your box of old coins, today's value charts show a steady increase. Full listing of all dates and mints of Franklin half dollars. Your 1955 half dollar is one of just a few worth above silver bullion value. 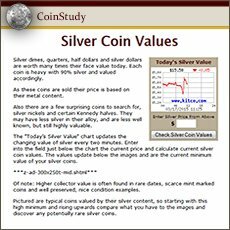 Heavy in silver content, old half dollars are worth $5.63 each. This is the starting bullion value, the vintage Barber and Walking Liberty series are mostly higher, and the original Bust and Seated Liberty half dollars are valued well above their silver content.